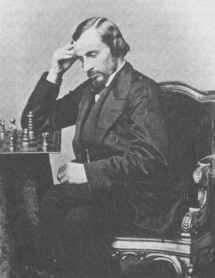 Daniel Harrwitz (1823 - 1884) was a German chess master. He established his reputation in Paris, particularly as a player of blindfold games. He lost a match in England to Howard Staunton in 1846 and drew a match with Adolf Anderssen in Germany in 1848. He lived in England from 1849 and founded the British Chess Review. In 1856 he moved to Paris where he won a match against de Riviere. In 1858 he played a match against Paul Morphy in Paris. Harrwitz won the first two games, but lost the match 5.5-2.5. Harrwitz withdrew from the match, allegedly on grounds of ill health. He subsequently retired to the Austrian Tyrol, dying there in 1884. This article is based on the article Daniel Harrwitz from the free encyclopaedia Wikipedia and stands under the GNU-Licence for free documentation. In the Wikipedia a list of the authors is available.